Jeff Snyder and Mike Solomon were at a poker game, expressing their disdain for the typical portable toilet, when the idea of Luxury Event Restrooms was born. "We were complaining about this blue-box thing, and how we'd rather go behind it than in it," says Solomon. The two men, who have more than 35 combined years in the hospitality business, tossed around the idea of creating a first-class mobile restroom. The impetus to make it a reality was Snyder's June 2013 wedding at his father and stepmother's house in Essex. With the home's bathrooms off limits to guests, he wanted to provide an alternative to the Porta-Potty. So Snyder reminded Solomon of their conversation about outdoor facilities, he recalls. "I said, 'Remember how we were complaining about it? I think we actually need to do something about it.'" 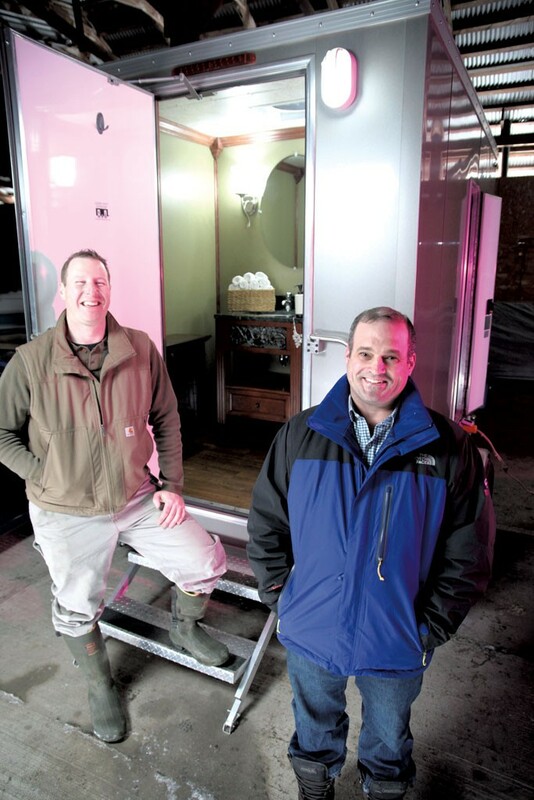 The pair embraced the business venture in earnest, and Snyder's nuptials became a testing ground for an upscale mobile restroom unlike any Vermont had seen before. "I was the typical client," Snyder adds, and notes that most of their business now comes from outdoor weddings. 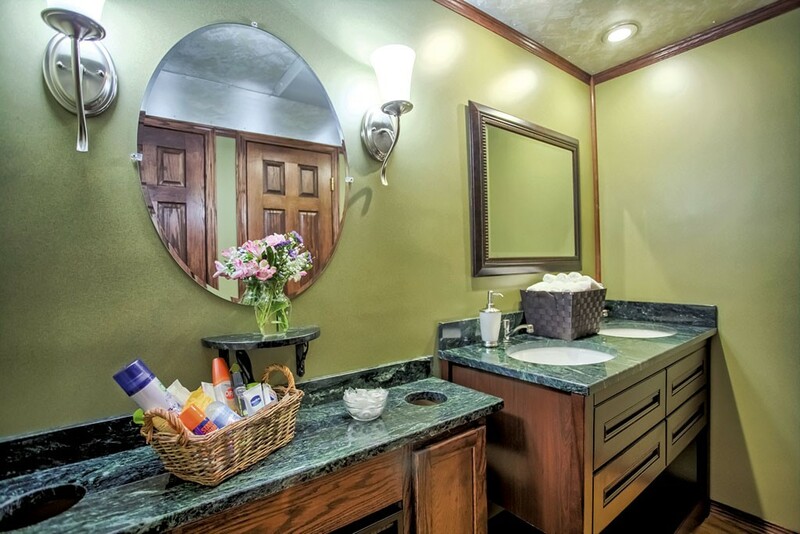 He and Solomon hired an independent contractor in the Midwest to customize two restroom trailers. Measuring 10 and 17 feet long, respectively, and eight feet, four inches wide, the trailers arrived in Vermont 80 percent complete. Each unit housed porcelain toilets and spacious bathroom stalls with paneled doors. The shorter trailer contains two individual bathrooms, while the longer one features two separate sections for men and women, with a total of four stalls. For the remainder of the décor, Snyder and Solomon enlisted Cecilia Redmond of Redmond Interior Design in Burlington. Picking up where the men's practicality left off, she lent her expertise to features such as vanities, light fixtures and the color scheme. "We needed a feminine touch," says Solomon with a chuckle. At Redmond's suggestion, Snyder and Solomon accented the restrooms with serpentine stone, a dark-green, semiprecious stone native to Vermont with likenesses to both granite and marble. They used it for the shelves, countertops and backsplashes. With the plumbing finalized by Snyder's father-in-law and the addition of central heat, air conditioning and a speaker system, the vision for Luxury Event Restrooms was realized. "The goal was to make it like a high-end hotel restroom," Solomon says. The business partners share an attention to detail that Snyder admits can border on the neurotic; they're determined to cover all the bases so their clients don't have to. "A bride and groom don't sit there and research a restroom. It's not what they do. It's not the romantic part of a wedding," Snyder says. He and Solomon, by contrast, have researched the bathroom business extensively and want to make the experience effortless for couples. "You tell us where [the trailer] goes, and you're done," says Snyder. This one-stop-shopping approach entails an all-inclusive per diem of $1,800 and $2,750 for the 10- and 17-foot trailers, respectively. Delivered for free within a 50-mile radius of Burlington, the units come with quiet generators, backup power and their own water supply — essential components for rural locations. Snyder and Solomon personally deliver the trailers to each wedding site, dropping them off up to a week before the event. The process can take several hours, particularly when inclement weather or last-minute location changes pose unexpected challenges. "You're taking something that weighs 8,000 pounds and is 20 feet long and putting it on the side of the hill," explains Snyder. "It's one of those things," Solomon adds. "The show must go on. The wedding's in two days, you get thrown a curveball; what are you going to do? You make it work." The partners have made it work in any conditions they've faced, building their business on consistent, high-quality customer service. That means staffing their restrooms with an on-site attendant and including amenities such as Wi-Fi, courtesy baskets and individual cotton hand towels. 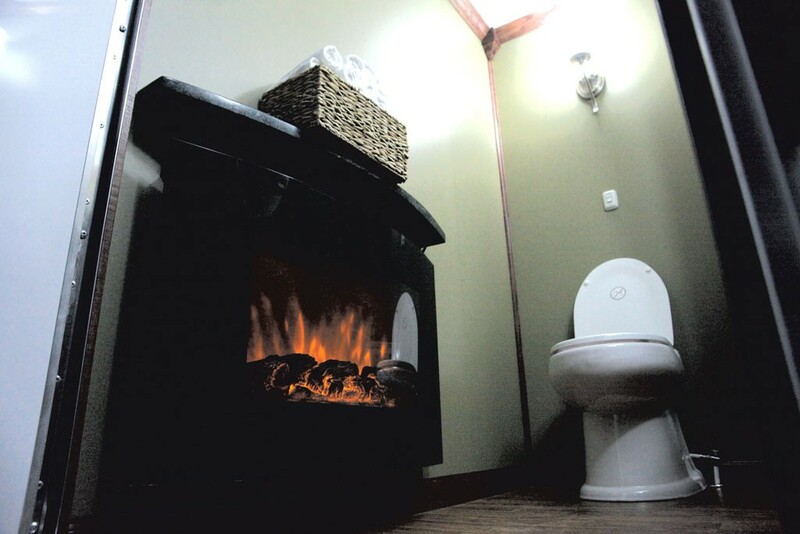 "It's not just a luxurious, deluxe restroom. It's also the service that goes with it," Snyder says. Luxury Event Restrooms doubled its business from 2013 to 2014, with two dozen gigs last year in an event season that runs just 20 to 24 weeks. Reservations for the 2015 season are rolling in, with August and September being the company's busiest months. Snyder and Solomon envision expanding their business down the road, but for now, they say they don't want to grow too big too fast. "Mike and I have pretty high standards," Snyder says. He adds that they welcome constructive criticism, asking rhetorically, "If it's not the best [bathroom] you've ever been in, why not?" So far, the response to the luxury restrooms has been overwhelmingly positive — some brides have even wanted their photograph taken in them. "We haven't had a complaint yet," Solomon boasts. He recalls a memorable moment when a bride said, "No one's talking about my wedding; all they're talking about is your damn bathroom." He and Snyder took it as a compliment. The original print version of this article was headlined "Luxury Loo"